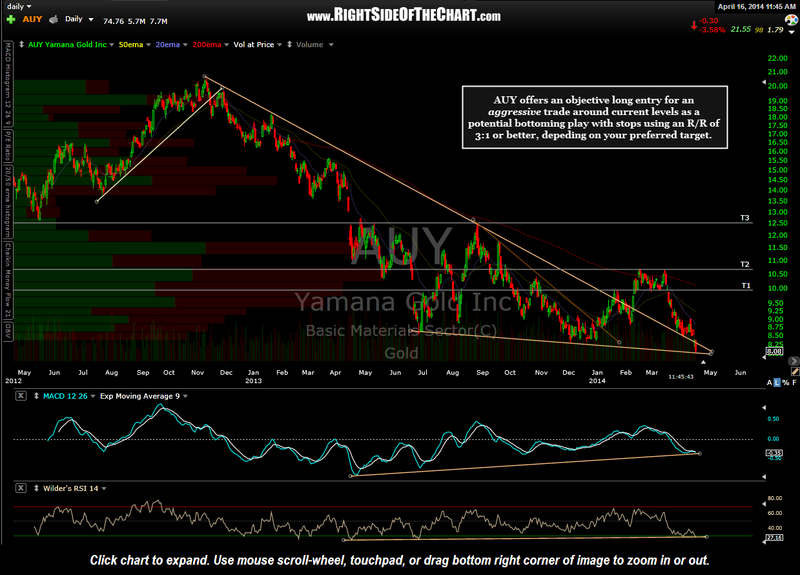 AUY (Yamana Gold Inc) will be added as an Active Long Trade & Long-term Trade idea around current levels (8.10ish). 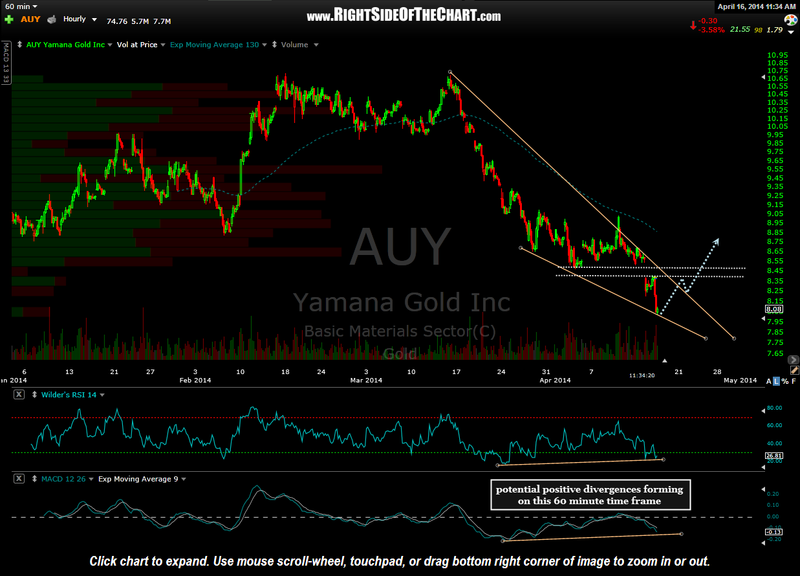 As this is an attempt to catch a bottom in the stock which has now fallen over 60% from its peak just over 6 months ago, AUY should be considered an aggressive trade. That, coupled with the inherent extreme volatility in the gold mining stocks, favors a downward adjustment in position sizing on this trade (as little as 1/2 – 1/4 my typical position size). 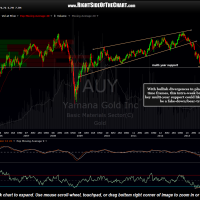 What I like about AUY, other than the fact that I continue to believe the gold mining sector may still likely be in the early stages of a new bull market that began in late December, is how the stock has broken below this key weekly support line. This breakdown may likely prove to be a bear-trap (i.e.- a false breakdown), with prices moving sharply higher if it does not stick. It could take a week or so for prices to close back above the weekly support line and if so, a higher probability, more conservative entry (or add-on to an initial position taken here) would be on a weekly close back above that level (roughly 8.40). Another technical development supporting the bullish case is the fact that we have positive divergence either in place or forming on the weekly, daily & 60 minute time frames. 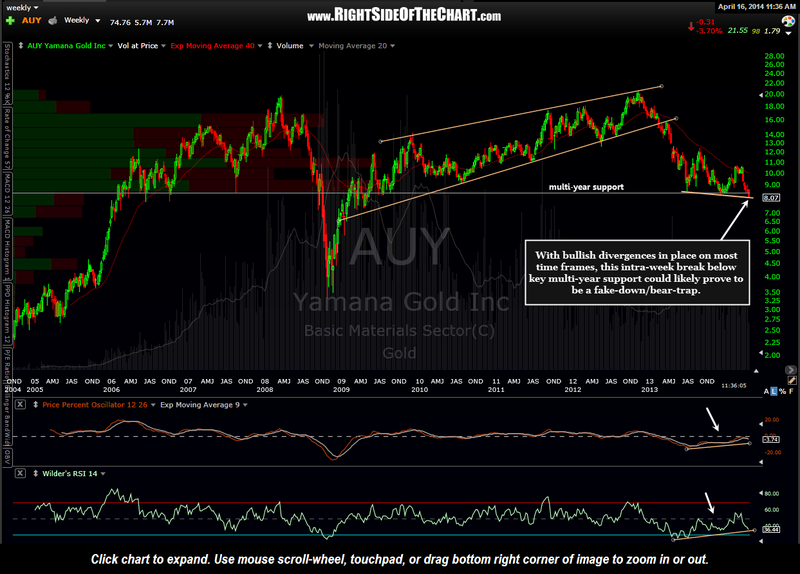 Once again this is a potential high risk/high reward long-term trade idea. With the first target (T1) 24% overhead and the final target (T3) about 55% higher, one must factor in the total dollar loss if the trade does not work out. Using a preferred 3:1 R/R ratio, that would allow for a stop about 8% lower if targeting T1 and about 18% lower if targeting T3 (edit: originally incorrectly listed the 18% suggested stop for T2 instead of T3). Of course tighter stops can be used but when trading the mining stocks, I find that trading a smaller position size to accommodate for more liberal stops significantly reduces the chances of being prematurely stopped out on trades that go on to hit their profit targets as the daily price swings in the mining stocks are unusually large.